It’s 1939, nearly midway through the season, and a full 16 years since Roy was an eager-eyed rookie on his way to try out with the Cubs before he was shot and nearly killed by the dark and deranged Harriet Bird (based on the real-life shootings of Eddie Waitkus and Billy Jurges), seriously waylaying his baseball dreams. Somewhere along the way, a cynical but no less honest Roy decided to get back into the game and finds himself traded up from the semi-pro Hebrew Oilers to the struggling New York Knights. Roy wanders into the Knights’ stadium during a sparsely attended game where the team is losing dismally to the Pirates (go Bucs!) The Knights’ cantankerous manager Pop Fisher (Wilford Brimley, of course), has just been bristling about his missed opportunities as a farmer and has no time for adding a “middle-aged rookie” to his team. Red, it took me 16 years to get here. You play me, and you’ll get the best I got. You can tell that Roy Hobbs has seen things when we first meet him. 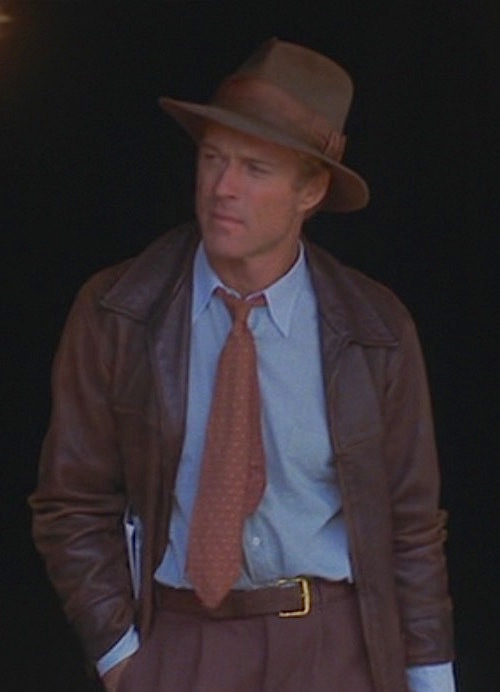 His well-worn leather jacket and fedora nod to the adventurous spirit of Indiana Jones, and Roy is only barely wearing his tie, loosened around his neck with an unbuttoned shirt collar that tells us he never meant for the look to be complete to begin with. 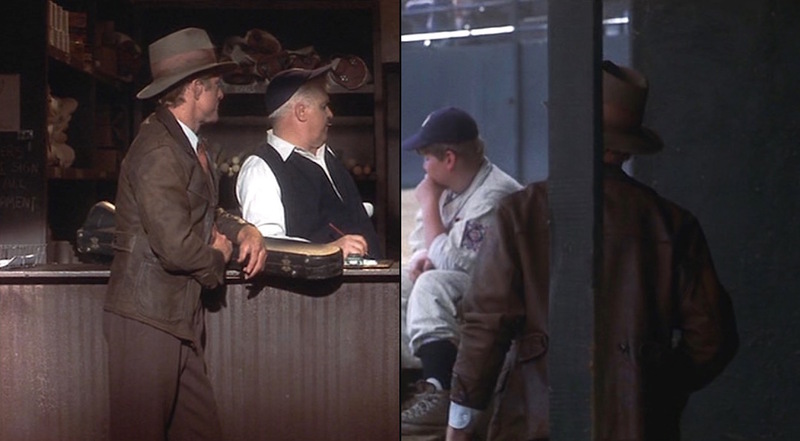 Our first glimpse of Roy Hobbs… the best there ever could have been. Roy later graduates to corduroy and eventually tweed jackets when he finds success on the Knights’ roster, but it’s the “skid row” leather jacket that remains a fan favorite to the extent that the demand caused Magnoli Clothiers to develop their own version, currently available for $425. 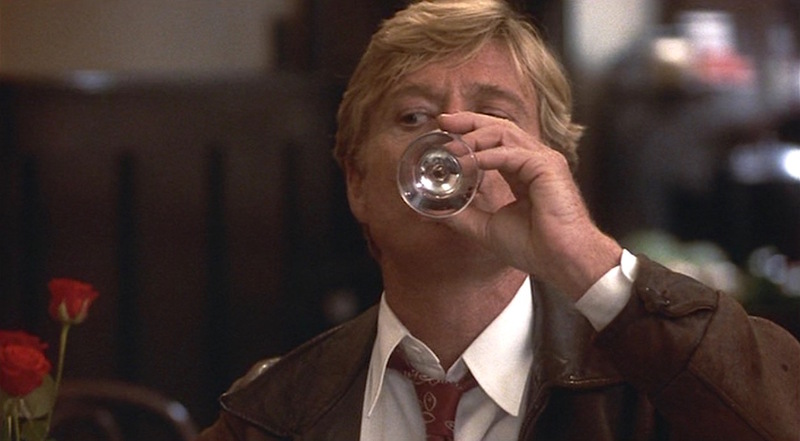 It shares some stylistic similarities to the U.S. Navy’s then-contemporary G8/Type 440 flight jacket, but Roy Hobbs’ tough brown cowhide jacket stands in a class of its own. The jacket has a zip-up front with a substantial shirt-style collar, horizontal yokes on the front and back, and set-in sleeves with a diamond-ended single-button cuff at the end of each. Knocking a few back with Red. Perhaps most similar to the naval flight jackets of the era are the bellows-type patch pockets on the hips, each covered with a flap. Two short oval-shaped tabs on the back – one on the right, one on the left – adjust the fit around the waist. Roy Hobbs picks out a #9 jersey (left) after leaving a still-fuming Pop in the dugout (right). Spot the adjustable button-tabs on the sides of his jacket. This “downtrodden” look certainly invites comparison to the tight, buttoned-up look of the eager 19-year-old Roy (who, yes, was still magically played by the 47-year-old Robert Redford). While young Roy wore a boyish tweed cap, stiff club collar and tie, and argyle sweater vest tucked in to his trousers and worn under suspenders, the older, more grizzled Roy opts for a dirty hat, loosened collar and tie, and a sloppy jacket. Fashion – and even fashionable decorum – may have changed in 16 years, but not nearly at the rate at which Roy’s outlook had evolved. Roy’s spirit has certainly been punctured by the time he arrives in the Knights’ dugout for the first time, but he’s still the all-American boy underneath, with his shirt and tie hinting at his red, white, and blue spirit. The light blue hairline-striped cotton shirt has a point collar, front placket, breast pocket, and button cuffs. His salmon colored tie has a subtle tan repeating pattern and is tied in a small knot, worn loosely around his neck. After Roy checks in to the hotel, he changes into a plain white cotton shirt and a maroon tie with a tan leaf-like Deco-styled motif. The shirt is styled the same as his light blue striped shirt, and under both shirts he wears a white ribbed sleeveless undershirt. Pay no attention to her, Roy. Trust me. Roy’s double reverse-pleated trousers are a purplish shade of brown, along the elusive “puce” spectrum. The trousers have side pockets, narrow turn-ups (cuffs), and belt loops where Roy wears a substantial brown leather belt with a polished brass single-prong buckle. 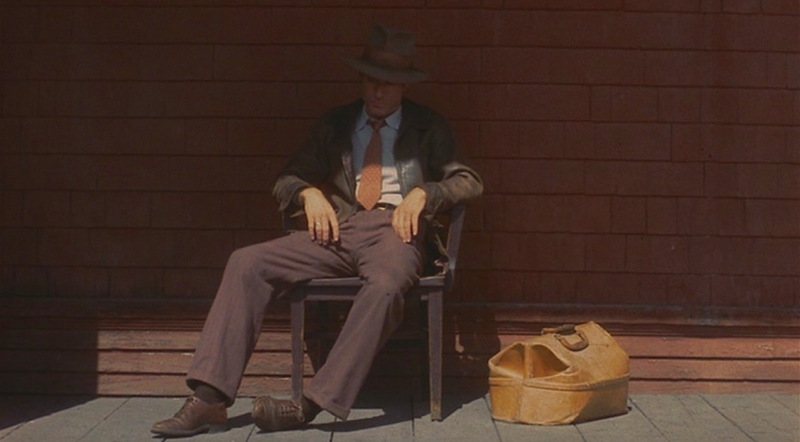 The belt coordinates with his shoes, a well-worn pair of brown leather cap-toe oxfords worn with dark brown cotton lisle socks. The end of the line for Roy Hobbs. If this next stop isn’t his big break, nothing will be. 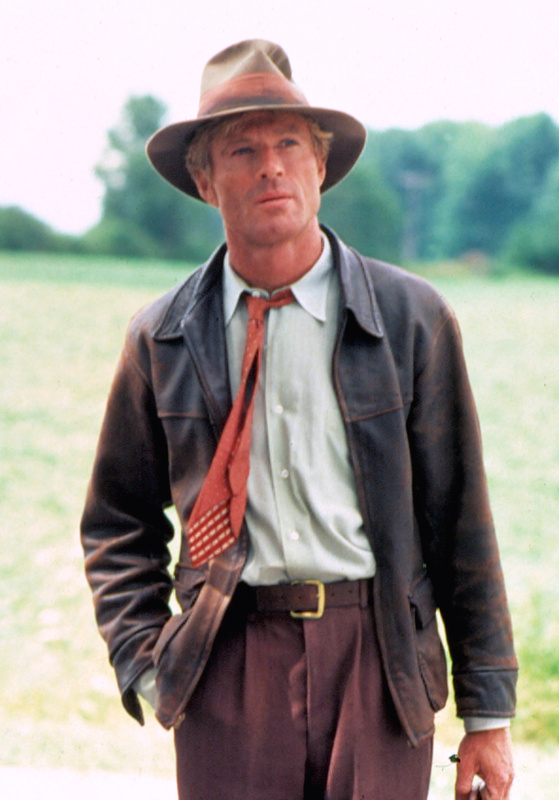 The silver ring on the third finger of Roy’s right hand should be familiar to Robert Redford fans; the actor received it as a gift in 1966 from the Hopi tribe, and he has worn it in most of his films since. Atop his head, Roy sports that most gentlemanly of ’30s headgear, the classic wide-brimmed fedora. Roy’s brown felt hat has evidently taken a tough path to get here, with a brown grosgrain band that has evidently faded around the top to a reddish tint. Check out the sparsely populated stands behind him. The Knights could surely use a talented wonderboy on their roster. Interestingly, Roy’s hat is a dead ringer for the one that his father Ed (Alan Fudge) wears in the flashback to Roy’s childhood, right down to the degree of fading along the top of the grosgrain band. 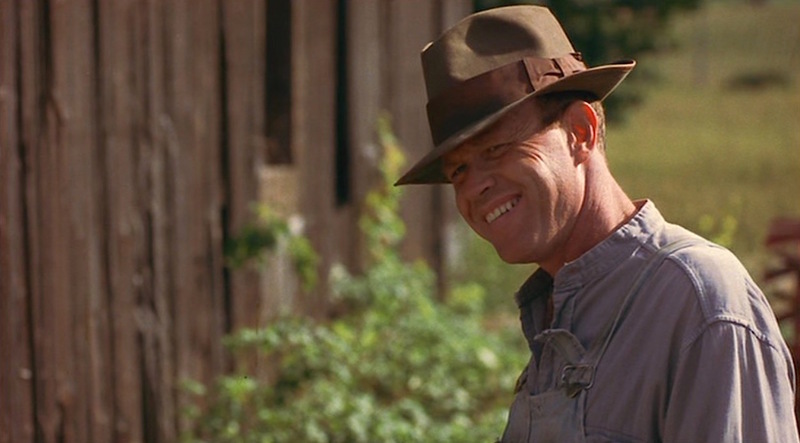 Roy’s father in 1915, wearing a fedora that wouldn’t emerge as a male fashion standard for another ten years, begging the question… is this an anachronism or a sign that the rural Midwestern Mr. Hobbs was an influential fashion plate? We may never know the truth. 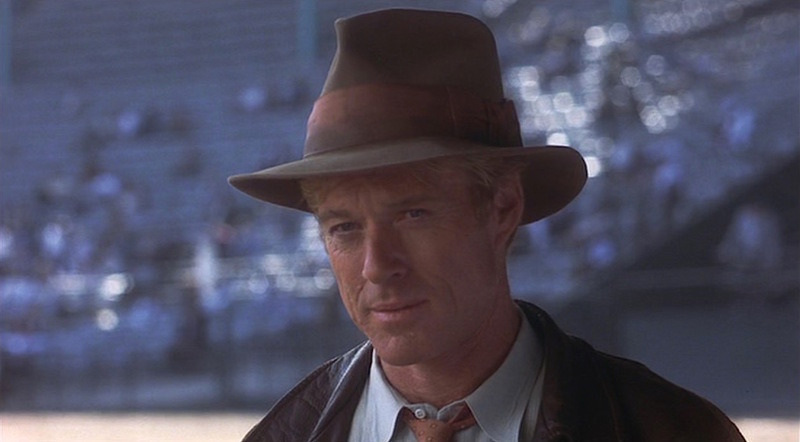 The flashback is set in 1915, nearly a decade before the fedora was popularized as the American man’s hat of choice following a visit from the Prince of Wales. From the 1890s to that point, it had been primarily worn by women and was even adopted as an unofficial symbol of the women’s suffrage movement in the early 20th century. 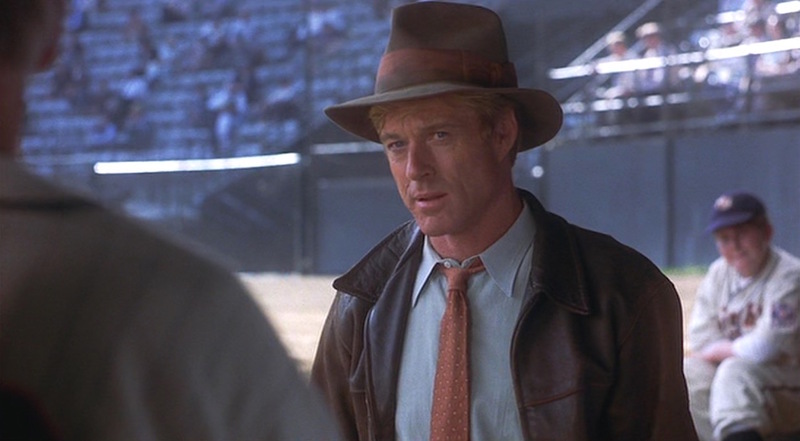 All-American baseball hero Roy Hobbs looks like the weary answer to Indiana Jones as he shows up to his first day on the professional diamond in a weather-beaten leather jacket, fedora, and shoes with a tie seemingly worn as an afterthought. Check out the movie… and give Bernard Malamud’s 1952 novel a read but be advised that the film took many liberties – often for the better – from its source material. I just got back in the game. Love it. I always wondered if there was a purposeful connection to Indiana Jones with the look. Has to be more than a coincidence. Brilliant article and so timely, with baseball upon us again. Not sure I agree with your views about the film being better than the book; there’s something about Malamud’s ending that resonates more, in my opinion. Nevertheless, loved this article – I must hunt down the movie on DVD/blu ray. A great article as usual, and enough of a push for me that I’m going to sit down and watch this movie. I do think that what you’re reading as fading on Roy’s hat’s ribbon is probably closer to the ribbon’s original color, and the darker section below is where he’s sweated through the hat. I’ve seen that enough in real life and it’s not pretty. 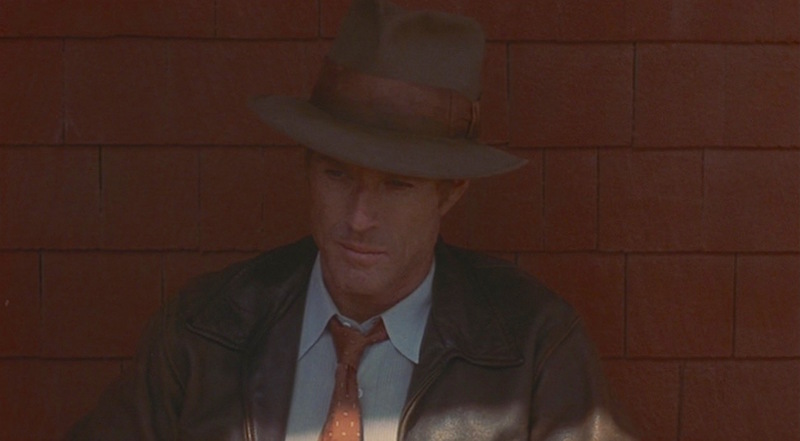 Was watching The Natural last night and thought — what a great leather jacket that Redford is wearing, with the Fedora — wonder how much that costs and where can you get one. Searched the internet and found this article. Terrific. Hits the spot. Nice to see there are like-minded people out there — and in this case someone has gone two steps beyond and written up an article on it. Good work.